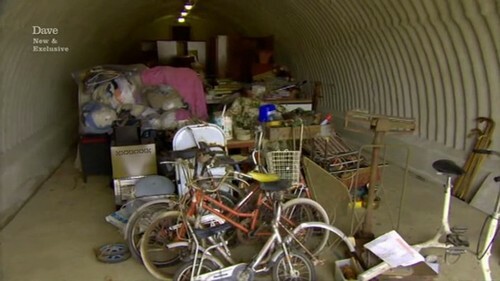 The location for the today’s episode of Storage Hunters UK is RAF Bentwaters. (to be clear it’s not really a unit, it is a hangar). A jeep or a car of some sort. 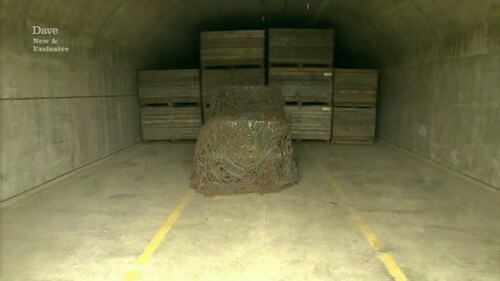 And a bunch of boxes hiding underneath camouflage tarp. John: Do you like it? John: Would you fit in it? Linda thinks it is an airplane. And this other stuff is a bunch of leaves. The bidding starts and Nat wins the lot for Ł1675. A bunch of stuff. And we mean this literally. Just look at it. Danny thinks it looks like a house clearance. Linda goes into long explanation how she gets sucked into bidding, then she bids and then she loses money and she doesn’t want to bid. We think Linda isn’t interested? The bidding starts, Linda jacks up the price and Danny wins the lot at Ł875. George thinks Linda made Danny look like a prat. We think Danny needs no help with that. Some wooden cabinets. A bunch of old looking boxes. And dear readers we have a new player. His name is Rupert (antiques and oddities expert). Just look at him. We don’t even know where to begin. The hair, the pants, the sash (is that a sash? What IS that? 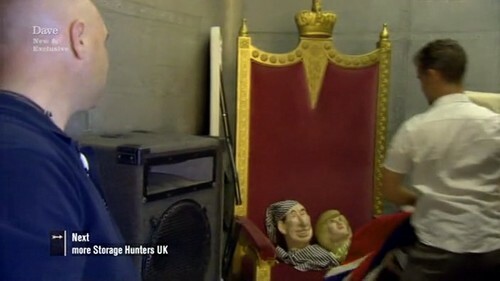 Also we thought this was Storage Hunters UK, not Miss Universe competition), but the umbrella… Look at that umbrella. We had a similar one. When we were in a 2nd grade. The bidding starts and Rupert wins the lot at Ł3700. Sean and Rupert go to investigate. A set of cutlery. The cabinets are a reproduction. 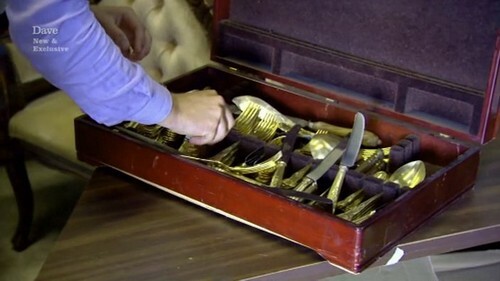 Some more cutlery (we think whoever owned this unit had a bit of a cutlery problem. Honestly, how much cutlery can you possibly need?). An empty box. And bingo… another box reveals a vintage looking gun. Rupert goes to grab it, but Sean is like – whoa dude stop! He explains you first need to check there is no live ammo inside. Then you need to a) call the police, b) call the auction house or b) call a licensed arms dealer to have a look. 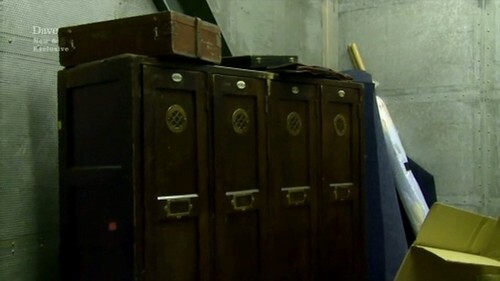 Sean, Nat and John go to investigate Storage unit number 1. And it is indeed a jeep under the tarp (so much for Linda and her plane theory). The jeep is in working condition. Underneath “the leaves” Nat and John find a bunch of paintball equipment and smoke bombs. Which given Nat and John’s proclivity for domestics – maybe they shouldn’t handle guns of any sort? On the plus side – at least it’s not real guns. 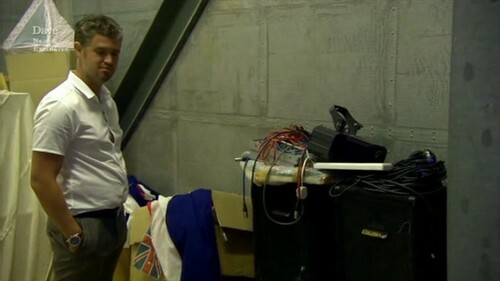 Danny goes to investigate all the stuff he bought. A bunch of clothes. 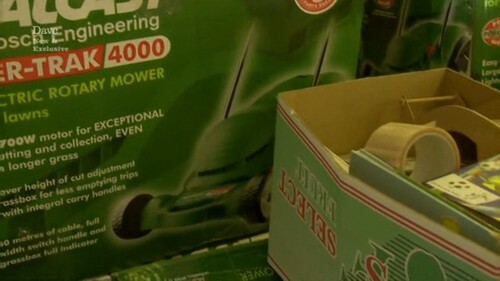 And 8 brand new lawn mowers. A bunch of chairs and other assorted stuff that *might* have been used for a street party. Both Linda and Danny are interested. Danny wins the lot at Ł3500 and manages to annoy Linda in the process. She shares she thinks he is smarmy and irritates the life out of her. Us too Linda, us too. Danny investigates the unit. A small PA system. A speaker. A throne with Princess Di and Prince Charles puppets. A flag. Danny makes a loss of Ł2300 on this unit. Rupert takes the pistol he purchased to be valued by the arms expert David Franklin Johnson. 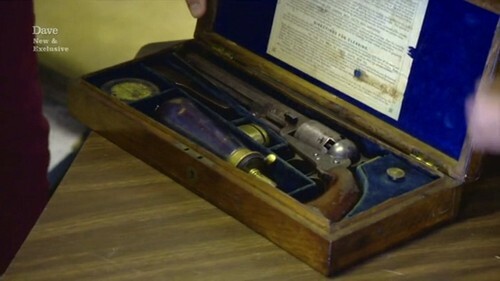 It is a Colt Navy revolver from 1854 (the year of the Charge of the Light Brigade). Last time a pistol like that was auctioned was a few years ago and it fetched over Ł5000. Obviously Rupert rubs his hands with glee. WOW, that is a good amount of money to profit on a storage unit! Way to go Nat and John!! That must really be annoying to bid on something like this only to be taking away someone else’s trash at the end of the day.